The community also had an interesting reaction to the Miyamoto banner that was installed at the entrance of the Lycee: normally, people in Cite Soleil do not appreciate signs and banners with donor logos because they are perceived as disempowering, as taking ownership away from the neighborhood. But the community appeared to appreciate this banner because instead of NGO logos on the banner, there were the logos of Haitian companies who were willing to put their name and brand on a project from Cite Soleil. There has been a perception in Cite Soleil of being abandoned by the private sector (while flooded by the development sector), and so seeing the logos of famous private enterprises on a banner marked ‘Cite Soleil’ was to them a gesture of faith and confidence in themselves as Soleyans. The word ‘Konbit’ was also very much appreciated – I overhead an exchange where one person was noting to another that this project was full of money because of all of the logos of the big companies. His friend responded saying, “No – don’t you see the word ‘konbit’? That means that each person chipped in a little bit to get this done.” So overall, the banner was positively received. The administration was very pleased to receive a visit from a delegation of American students with Mr. Miyamoto. In addition, a championship football tournament was held in the open space that was created from the removal of the first temporary classrooms. 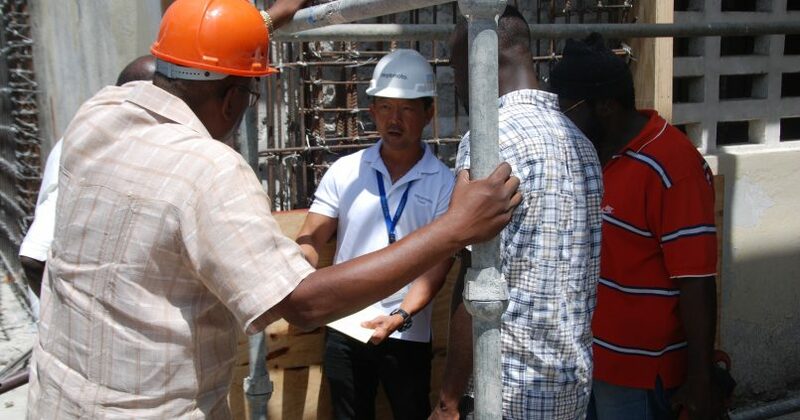 I also cannot avoid mentioning that the community has had so many negative experiences with previous development and construction projects that if the engineers does not show up for a few days to do off-site work, community members begin to worry. This project has been an exercise of trust-building since the beginning and it will continue throughout the end of the project, and hopefully stand as a great model of community partnership. This work is so important to them that community want to see the work finished before the start of the next school year, in September. During one of my visits, school had officially let out for summer vacation, but there were still some students around for classes to help them prepare for the State Terminal Exams. I talked with a few of them about the project, and filmed the exchange. “My name is Stephanie and I’m from Soley 4. I am in the Philo class for 2013-2014. I want to become a health agent to give help in my society. That is my plan. I don’t like it when people are suffering and I cannot help them. In terms of the Lycee, at noon, the sun is so hot for us underneath the sheet metal roof. You cannot study – it is a catastrophe. I had done all of my previous classes at a private school, but I wanted to do my last year at the Lycee [for economic reasons]. After a few months, I heard that there was an organization that was coming in to fix the school. At first I thought it was the government, but the administration said it was a private organization that was offering its help. I liked that, although I won’t get to benefit personally from the work, I am happy to see the Lycee become beautiful again and I will come back to visit.” -Stephanie Lestin, 22 years old. “My name is Charles and he lives in Simon Pele, and I go to school here doing Philo. 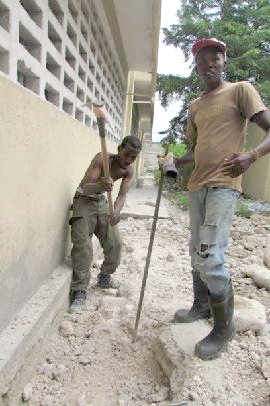 As for the work to rehabilitate the school, I think it is a great thing. It was something that should have been done a long time ago. Even if I am going to leave the Lycee, it is a wonderful thing for the young people who will come after me. 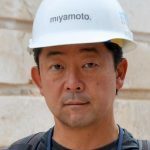 I think it is a good thing and I congratulate the organization [Miyamoto] that is doing the work. Because we were learning under the sheet metal roof, it was hot and prevented us from learning well. The young people who will follow me, they will be able to learn better, they will be better supported, and they will be better trained. Last, I would like to thank the organization, Miyamoto, because I am happy about the work that is being done, and I would like them to do more work like this.” -Charles Charlot, 23 years old. 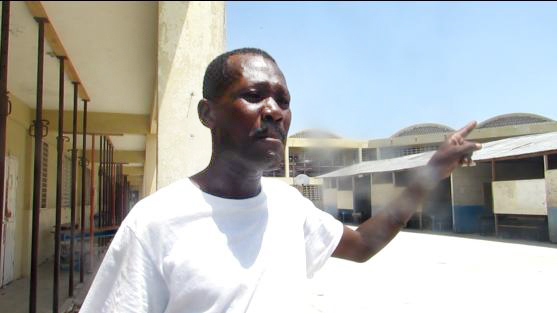 “The Lycee is the last monument we have left in Cite Soleil. We cannot leave it for it to break down like this. It is our biggest monument and we don’t have anything else like it. 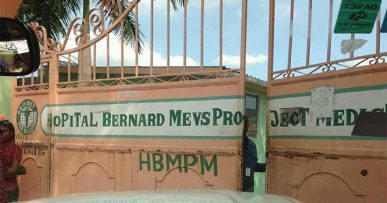 We had this school and Hospital St Catherine, and the hospital has fallen apart, so we cannot let the school fall apart. When you have something important like this – a place where a child can come and pay 300 gourdes-400 gourdes for a student to go from 7th grade to Philo [terminal grade], that is something important. I was very happy with the start of this work of rehabilitating the school, but when I saw that the work had stopped over the past weeks I started to get angry because this work is important. 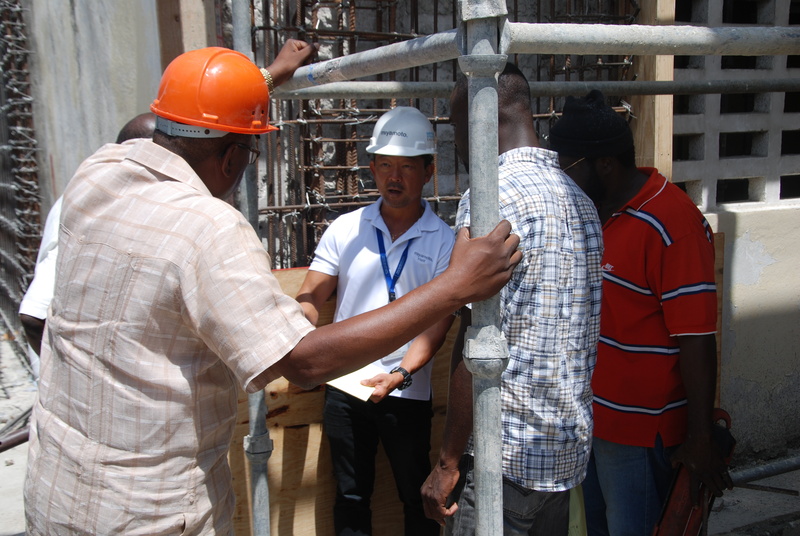 I would say for the institutions that are involved to encourage the construction firm to work more quickly. -Duversaint Jonas (Ayile), 42 years old. Community leader in Soley 17. “I am very happy about the rehabilitation of the Lycee because the students were living under a tent and the structure of the Lycee was damaged. And it is good for me because I am selling pate [fried dough snack] here and the students buy from me. The work is good because it takes the children out from under the shelter because it isn’t good for them. It was so hot and the children were suffering and not working well. My child is a student inside too, and I’d like the children to have the space for them to be comfortable, to play, to be happy. I would like to encourage whoever is doing this so that whatever work is left to do will be done.” -Judith Alexis, 52 years old. Community member and mother of a student. As of July, 2014 work had continued throughout the month of June, with more holes being dug and the poles being installed. At the beginning of the month, as school was ending, the community was very happy with the progress made. They saw the contractors were working hard. When I spoke with community members, they appreciated both the rehabilitation work and that there were young men in the community benefiting from jobs digging out the foundation. Louino Robillard, August 29, 2014.